In 2018 – the second year Picl is active in the Netherlands – the views for the platform that connects cinemas and VOD have doubled. Most interesting is that in 2018, also the independent cinemas attract remarkably more visitors. The medium and small movie theaters that focus on more artistic films have had an excellent year. They attracted nearly 3 million visitors in 2018, an increase of 3.5 percent compared to 2017. The total market share of this group of cinemas rose to almost 10 percent. These promissing results are supported by the user sevey that was conducted. 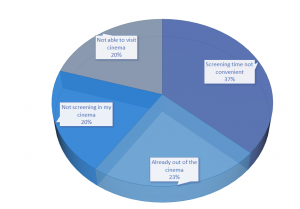 Most visitors at Picl state that they prefer to watch a film on the big screen at the cinema’s (almost 90%), but that for serveral reasons, they do not see all films at the cinema. Also, Picl is able to reach a younger audience for European arthouse films.